Now the runway renovation isn't the only project happening on Caye Caulker. San Pedro Belize Express Water taxi is dredging near their pier. Now some expressed concerns that this project could be damaging to the environment and to the reef. But Area Rep Heredia says the project is quite safe and all residents will benefit from it. "Permission was granted by the department of hydrology, I believe who are the pertinent body, to San Pedro Belize Express to do a dredging on the side of their pier, because the water was too shallow and propellers were breaking every now and then. So after studying that with the pertinent bodies, they decided to grant them a permit to do it with the condition that all the materials will be for the use of the community and hence you can ask in Caye Caulker I think 3 days now they have been on the streets - just the cost of transportation whatever. That is what they are charging. 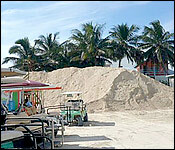 But the sand will be distributed to all needy people including the 3 schools that we have." "The schools have received a substantial amount of that material. Material is extremely scarce and so this opportunity from this company paying for the dredging and donating all the materials. You cannot get a better deal than that and I am sure that if you call the majority of people over there, they will tell you that they are happy to be receiving this material in their yards, particularly with this weather." "Usually when they give this permit, they ensure that you have a curtain that will not spill any silt to the reef. But I must say anything that you do have little negative effect." "Has the department of environment cleared this project?" "It is done by all bodies: Fisheries, department of the environment and geology. That is the procedures." 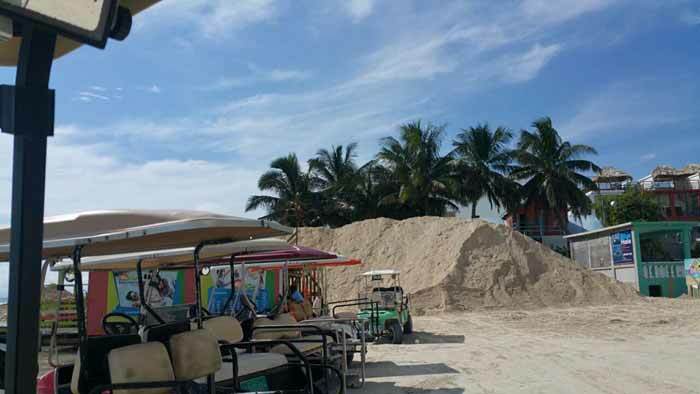 There have been complaints from residents on Caye Caulker that a dredging project may have adverse effects on the surrounding ecosystem and the barrier reef. Since the beginning of this month, San Pedro Belize Express Water Taxi has been dredging a spot next to its docking pier on the island because its boats have been experiencing various challenges. And even though concerns continue to mount, Belize Rural South area rep and Minister of Tourism Manuel Heredia Junior says that permission was given by the Geology Department to the water taxi for its dredging activities. 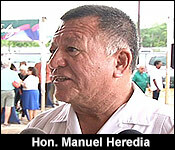 In fact, Heredia Junior says that residents have been benefiting from the project. At the beginning of this month, the San Pedro Belize Water Taxi in Caye Caulker began dredging an area next to their docking pier. Many residents of the island are concerned that this activity will have a negative impact on the surrounding ecosystem, especially to the Barrier Reef which is less than a mile east of the island. San Pedro Belize Water Taxi started the dredging project after they claimed to be experiencing various challenges, such as too shallow water causing the boat propellers to continuously break. Apparently, they requested a permit to start the dredging, which was granted to them by the Geology Department after they studied the problem. A permit was granted with the condition that the community would benefit from the material (sand) produced from the dredging. 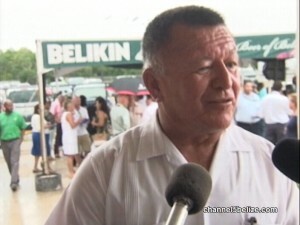 “Material is extremely scarce and so this opportunity for this company to pay for the dredging and donating all the material, you cannot get a better deal than that,” said Area Representative for Belize Rural South Manuel Heredia Jr. Therefore, all materials resulting from the dredging has been going to different areas in the community, such as schools and streets.